In college I studied music theory and then went on to work as a musician. I also worked part-time as an assistant minister in my church, and because of my background in music, I was sometimes asked to speak about “Christianity and the arts,” “faith and beauty,” or some similar topic. It is painful when I come across the notes for these talks now. I hadn’t yet been to seminary, but the problem really wasn’t my ignorance of theology. The biggest problem was that I didn’t have a very clear understanding of art. My twenty-two-year-old self would have been offended by this assessment. I had a degree in music, after all, and had played music all my life. But this involvement had only intensified (rather than corrected) my misconceptions about art. 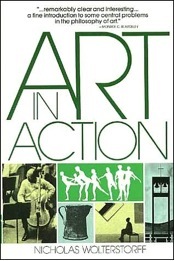 At least, that is how it seemed to me a few years later when I read Nicholas Wolterstorff’s Art in Action: Toward a Christian Aesthetic—the first book I ever read on Christianity and the arts, and probably the best. Wolterstorff was for many years professor of philosophy at Calvin College and then, until his retirement, Noah Porter Professor of Philosophical Theology at Yale. His book is rich with Christian wisdom and theological insight. What hit me like a revelation, however, was how the book challenges many of the ideals and assumptions enshrined in our culture’s thinking about the fine arts. Our culture of high art, for instance, portrays the artist as an innovator. The Great Artist pushes back boundaries and breaks new ground. But, Wolterstorff points out, other times and cultures have thought of the artist primarily as someone immersed in a tradition, someone who preserves and develops what has been received from the past. Modern Western thinking about fine art has suggested that the artist’s principal job is to be creative, to produce something entirely new. Yes, says Wolterstorff, but there is also an important sense in which the artist is to be responsive, and this is something our culture has largely overlooked. In a good world created by God, one dimension of the artist’s calling is to respond to what is already there—to recognize and cultivate the distinctive character of sound, wood, and stone. Our culture of fine art has often conceived of the artist as an iconoclast. He shocks and challenges, he overturns conventional ways of thinking. He may (at first) be unappreciated, but the true artist is unconcerned with the opinions of the general public. He must follow his art and his own creative vision. Perhaps, Wolterstorff responds. But the Christian artist is also bound, no less than the rest of us, by the command to love one’s neighbor as oneself. The artist is a responsible servant. Most importantly, in the modern era our culture has increasingly thought of art and beauty—which for centuries served to enrich and enable ordinary life—as something altogether set apart from ordinary life. We think of art as something that lives in museums, concert halls, and theaters—purpose-built structures specially designated for aesthetic contemplation. But art, Wolterstorff counters, “is man’s way of acting in the world. Artistically man acts.” Art is not the specialized calling of a few highly trained prodigies. Song and dance and story are universally and paradigmatically human activities. Moreover, God has made human beings for shalom, for delight. And so a world in which beauty has been cordoned off into museums, in which the look and sound of things is the unique concern of professional critics—this is an impoverished world. Cultivating a world made delightful by art and beauty is in fact part of our calling as human beings and as Christians. If we hope to think in a Christian way about the arts, we must know not only something about what Christianity is but also something about what the arts are. Art in Action is such an important resource because of the way it educates us in both of those areas. It is a book that requires your full attention, and in some places a bit of work. You’ll need to turn the TV off and keep a pencil in your hand. But it is also a book that is worth your full attention and will repay whatever time and effort you invest in reading it.